shibaa987 2 years, 11 months ago. Here is a very simple Step-by-Step guide on How to Unlock Moto G4 Plus’s Bootloader. I will be taking you through a damn easy Step By Step beginner’s guide which I bet to be a buttery smooth experience even for the first time users. Just make sure to follow each instruction and you must not SKIP any step unless stated you can in this guide. It is important to understand that there could be some side effects if the instructions are not followed properly. 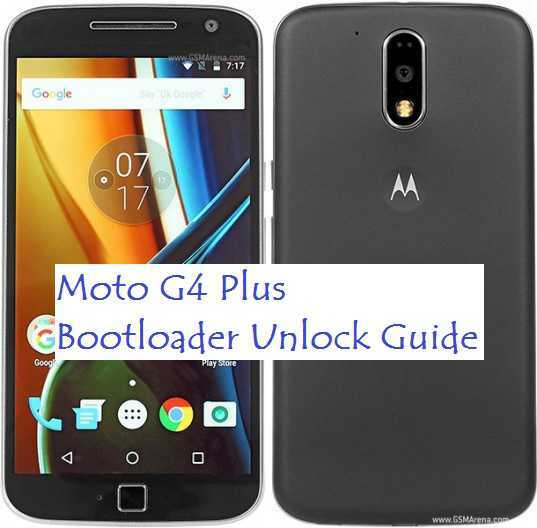 You will lose your data while unlocking the bootloader on Moto G4 Plus and hence before proceeding further you may consider backup all the data on your Moto G4 Plus. YOU are the only person making changes to your phone and I cannot be held responsible for the mistakes done by you. – Moto G4 Plus phone. – Device Drivers for Moto G4 Plus. – PC installed with Fastboot binary. Download appropriate USB driver installer from above download links and Install USB drivers for Moto G4 Plus on your PC. Install fastboot utility on your PC. Here is the fastboot installation guide for Windows and here is the fastboot installation guide for MAC and Linux. Then go to Motorola website: http://www.motorola.com/unlockbootloader and register or login using Google user details. Read and understand the risks involved by unlocking the bootloader on your Moto G4 Plus Phone and then click on NEXT. Put the Moto G4 Plus into Fastboot mode. First power off the phone, then press the Power and Volume Down buttons simultaneously. Now you have to copy only the Alpha-Numeric data (including the # or any other symbol in between) by discarding the (bootloader) on Windows output or INFO on MAC output. You can see the above data is in a single line which is basically an appended data of all the above 5 line output. This is a bit tricky part if you are a beginner. To make it simple, Motorola has a Data scrub Tool where you need not to bother of arranging the Console out put data. You just go to the Scrub Tool webpage, copy all the out put from your Console or terminal (Don’t worry for the bootloader and INFO strings, the Data Scrub Tool will discard automatically) and then paste it on the Data Scrub Tool webpage and click on Format my data to get the one line sorted data. Now, copy the final one line loooong string into the Motorola Bootloader Unlock page and click on Can my device be unlocked? If your device can be unlocked then Request unlock key button will appear. Read the agreement and click on I Agree, after which the Request unlock key button will appear. Click on that button to get the Unlock key. The unlock key will be mailed to you on your e-mail Id which you used to register at Motorola site. That’s all my friend. Now your Moto G4 Plus’ bootloader is unlocked. If you have any concerns or if you are facing some problem while trying this guide then just login and reply to this thread and rest assured I will try to help you as soon as possible.